There is slow-moving traffic on one of Preston's main arteries tonight after a two-car collision. Lancashire Road Police said the accident, which happened at around 5.30pm this evening, is causing congestion on the A583, Blackpool Road, Clifton. They tweeted: "HO38 and HO48 dealing with a two vehicle road traffic collision, Blackpool Road, Clifton. Please take care in the rain and be mindful of slow moving traffic as a result." 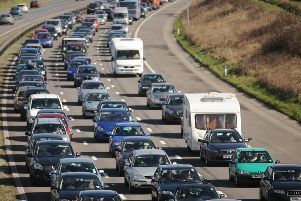 AA Roadwatch said the road was "partially blocked and queueing traffic due to accident". It reported that: "Lancashire police are on scene guiding traffic pass the scene, sensors show traffic is particularly affected eastbound heading out of Ashton on Ribble." Elsewhere tonight, a broken down double decker bus is causing problems on the M6 southbound between junctions 32 and 31a, with one lane closed.